The measurement of water activity or equilibrium relative humidity (ERH) is a key parameter in the quality control of moisture sensitive products or materials. Water activity is by definition the free or non-chemically bound water in foods and other products. The bound water cannot be measured with this method. WHY IS WATER ACTIVITY MEASURED? water available, the products spoil, and if there is too little water available, other product properties can be influenced negatively. The table shows typical growth thresholds below which the specified organism cannot reproduce and therefore spoil the product. Control of water activity therefore has a significant impact on the shelf life of a product. The measurement of water activity also provides useful information on properties such as the cohesion, storage life, agglomeration or pourability of powders, tablet stability, and the adherence of coatings. 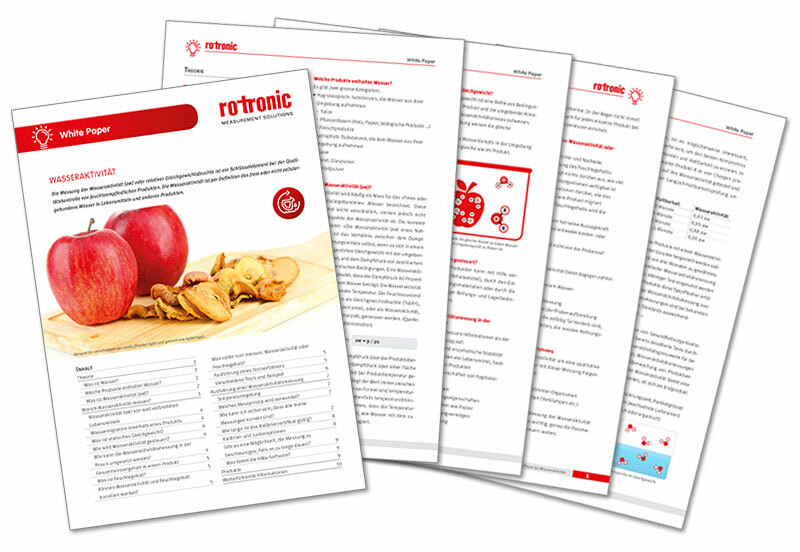 The Rotronic water-activity probes work with digital HygroClip technology, which ensures their high performance and simple, digital calibration. They can therefore be used in practically all fields of application. All water activity stations and probes incorporate temperature measurement as a standard feature. The water activity measurement stations measure in a range of 0…1 aw, which equates to 0…100 %RH, and supply a digital output signal, which can be displayed directly on a PC (HC2-AW-USB) or the HygroLab C1 and HP23-AW-A display units. Digital calibration can be performed with these instruments or with HW4 software running on a PC. The HC2-AW probes have a large thermal mass. This means they react very slowly to temperature changes so that virtually no variations arise during measurement – especially when using the AW Quick function. The extremely small internal volume of the sensor chamber ensures humidity equilibrium is reached very quickly for all products. Browse our brochure and find products and solutions for measuring and monitoring water activity as well as information on software and calibration. White Paper "Water Activity" - Download Now! The Whitepaper contains detailed theory about water, water activity and water content. It also provides information on where and why it is important to measure water activity and how to perform water activity measurements.